Kanye West has reportedly been hitting the gym up to six times a week to aid his mental health. The Stronger hitmaker spent nine days at the University of California, Los Angeles (UCLA) Medical Center last month (Nov16), when he was admitted for a mental evaluation after reportedly suffering from exhaustion and sleep deprivation. He was released into the care of his personal physician on 30 November (16) and has been recuperating at home ever since. Now TMZ.com have revealed Kanye has embarked on a new fitness regime in a bid to help his recovery process. According to the website, Kanye has been working out with trainer Don Brooks in his home gym and other local spots, up to two hours per session. The father-of-two apparently works up a sweat doing resistance training with bands, skipping and some one-on-one basketball. 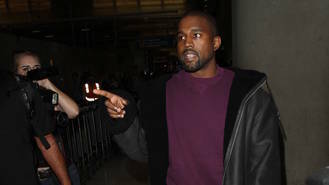 TMZ also reports that despite some initial concerns about the state of Kanye's marriage to Kim Kardashian, the musician has been "very present" with his wife and children. Trainer Don is no stranger to Kanye's family, having previously worked with Kim, as well as sisters Kourtney and Khloe. Khloe in particular has been very vocal about how much exercise has helped her mental state after a series of turbulent life events, such as the breakdown of her marriage to Lamar Odom. "About two years ago I decided to turn to fitness as a form of therapy and as a stress reliever," Khloe captioned a picture on Instagram previously. "I started slow and eventually I started working out 4 to 5 days a week. We all have to start somewhere and doing something is better than nothing at all." Idina Menzel wishes she could write about everything wrong with her life rather than penning songs about finding inner strength. Nick Cannon is sticking to his work commitments following his hospitalisation earlier this month (Dec16). Magician David Blaine is reportedly helping Madonna mend her relationship with her son Rocco Ritchie. Country superstar Keith Urban will ring in 2017 by headlining a free show in his adopted Nashville, Tennessee. If you thought 2016 couldn't get more bizarre, just take a look at Azealia Banks' latest Instagram story. Adele’s third studio album, 25, was Christmas’s most unwanted CD, figures show. Jade Thirlwall has defended Little Mix's saucy new tone, insisting their songs are all about empowering women. The Black Keys' Dan Auerbach is releasing a new solo album in 2017. Rudimental believe it is a "blessing" they are not working in a supermarket.